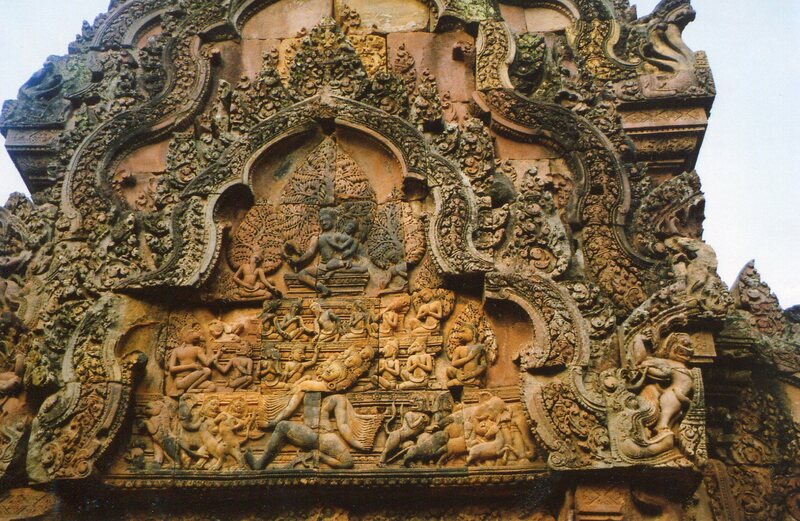 In this final post on Banteay Srei, we’ll examine some of this temple’s deepest meanings. 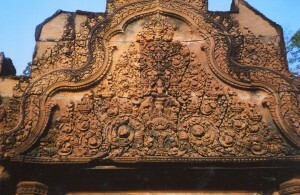 As you approach Banteay Srei from the east on its causeway, you come to this carving over the gate. Indra is driving his BMW. At least it was Indian mythology’s version of what many Indians meditate on today. But in ancient India, Indra and the elephant were both associated with rain that came with the monsoon. 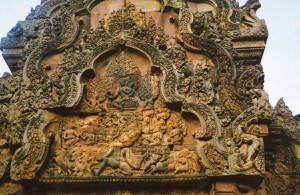 The Khmers carved several images of Indra on his mount at Banteay Srei. The dense garlands around Indra look like animated clouds, as though this carving will bring the rains with sympathetic magic. I don’t know about about the monsoons, but it sure helps attract Korean tour buses. But this image only hints at what’s on the other side of the gate. After entering, you find a library on your right and left, and the central shrine presides behind them. The central shrine and the south library were dedicated to Shiva. The north library honored Vishnu. The friezes carved on the libraries approached a revolution in perspective. Above is a frieze on the north library. We see Indra on his elephant again, and the wavy lines under him represent rains that he’s sending to the forest. But this carving expands the perspective to a complex narrative scene underneath. Vittorio Roveda, in Images of the Gods, wrote that it’s from the Mahabharata, Book I. Krishna and Arjuna (the 2 main protagonists in the Bhagavad Gita) were resting in the forest when the god of fire and Vedic sacrifices, Agni, approached them. He was famished, but couldn’t consume anything in the forest because Indra kept sending rain. Krishna and Arjuna then fired arrows skyward. You can see them as the densely packed straight lines pointing upwards, just under the water. Many gods tried to stop the barrage of arrows, but they ultimately admitted defeat. They accepted Krishna and Arjuna’s invincibility, and Agni ate his fill. 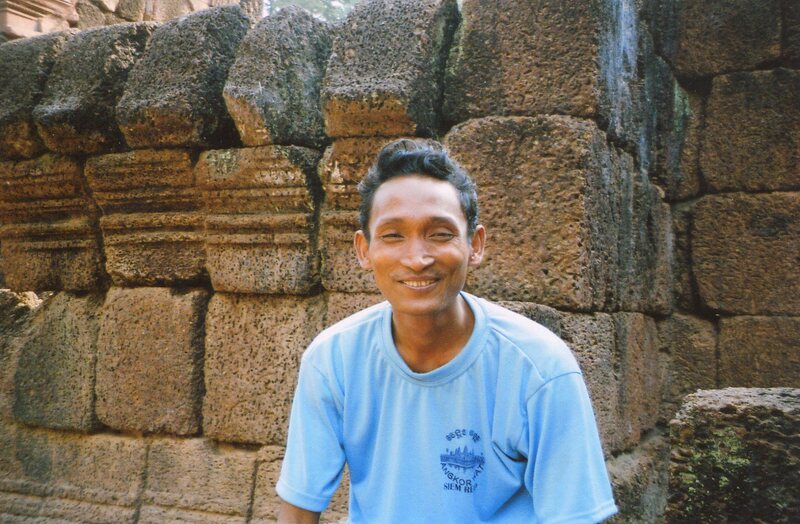 Banteay Srei was dedicated to Shiva, so we better give him equal honor. The above image is from the south library, Here, he and his wife, Uma, recline on Mount Kailasa–their traditional abode. Underneath, Ravana tries to disrupt them by shaking the mountain. Shiva presses his foot on it and stabilizes it, while a frightened Uma snuggles up to her husband. Under them, ascetics and supernatural beings appear agitated. Both of these panels use sweeping perspectives to show the gods upholding the cosmic order. In the first, Krishna (an incarnation of Vishnu) checks the power of the monsoons, and balances the forces in the universe. In the second, Shiva preserves the order from the cosmic mountain he lives on. Khmers adopted these panoramic stories from Indian texts like the Mahabharata, the Ramayana and the Puranas. These narratives are much longer, and include more fantastic characters than most Western texts. They’re concerned with the biggest of the big: the creation, preservation, and ultimate dissolution of the universe. Khmers adopted these ideas of vast cosmic cycles and used them to project the powers of royalty and the gods in their growing empire. 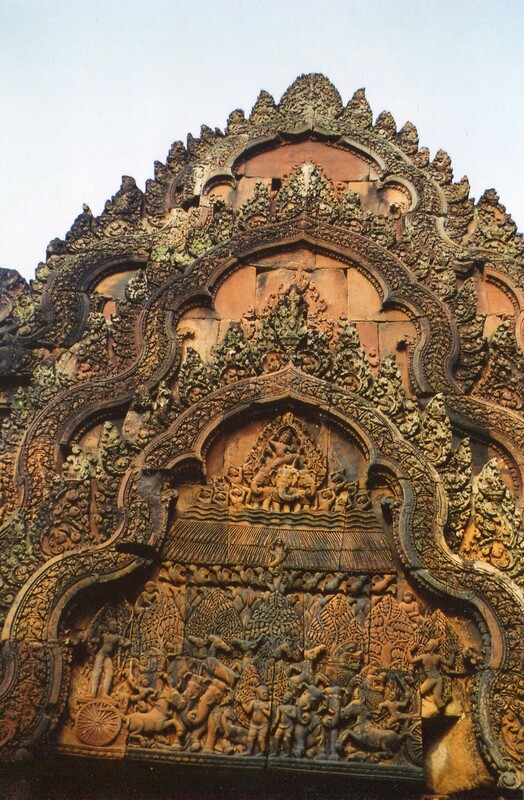 So, Banteay Srei is a convergence of two cultures’ favored ways of representing reality. Both often preferred the cosmic over the specific. The temple’s pink sandstone allowed artists to realize these visions in expressions of universal harmony. Khmers later put these epic perspectives in Angkor Wat’s friezes. They were useful for kings keeping a huge kingdom of rice farmers in line, and they were easily associated with the power of the monsoons and the annual flooding of Tonle Sap. But Banteay Srei’s dainty size and elegant carvings balance the epic perspectives. The man above was introduced to me by his friend, a tall fast-talking New York construction worker. The Cambodian ran an orphanage. The New Yorker described the enormous amount of work his companion does–he seemed too modest to explain it himself. His serene smile and the construction worker’s outgoing personality formed contrasting views of the varieties of human graciousness. People left many offerings at this temple between 1000 and 1300, and some of the priests must have been as gentle as these people. I wasn’t sure whether to enjoy the people or the temple more. 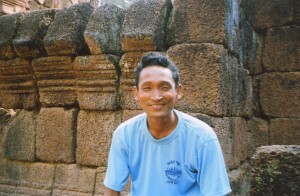 Banteay Srei balances sweeping perspectives and human warmth better than its enormous descendant Angkor Wat does. All domains in the universe are in harmony there. 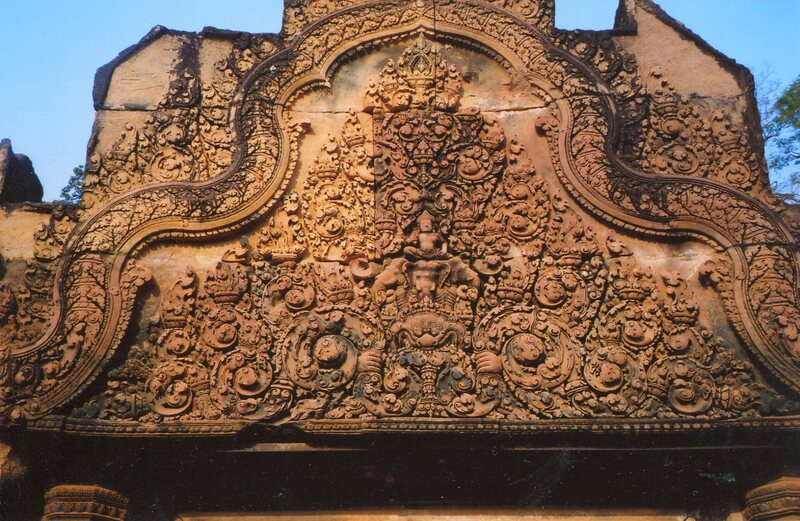 The first part of this series is Banteay Srei.